A minimalist movement meets warm, organic materials in this modern design. A minimalist movement meets warm, organic materials in this modern watch design. Inspired by lunar calendars, the solid maple face features 12 windows that frame orbiting black (hour) and orange (minute) dots that mark the time. Accented by a soft, natural cork band, it's a distinctive accessory infused with contemporary cool. Movement and stainless steel case made in Japan. 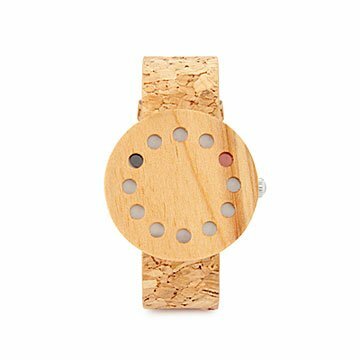 Wooden face and cork band made in Miami, Florida. Splash proof and moist proof. Do not submerge under water. Great gift, got it engraved!